A honeymoon designed to combine luxury & beach time with immersion into the wonderful culture of Vietnam. Adventurous honeymoons are something I really enjoy putting together for people. Just like organising a wedding, it’s about working with you on your ideas, then fine tuning each of the small details until it’s perfect. These clients wanted to enjoy some chill time on the beach somewhere luxurious that wouldn’t blow their budget, but they also wanted to explore and immerse themselves in the culture and way of life. I particularly like the idea of a food based walking tour to experience the backstreets of Hanoi, local markets and speciality food stores. We worked to a £2,000pp budget on this, but the upgrade to the Superior Halong Bay cruise proved too tempting to pass on! Golden Lotus Luxury Hotel is a new, centrally located boutique style hotel, just a short walk from Hoan Kiem Lake. Traditionally furnished and containing local artworks the small yet comfortable rooms are well designed and beautifully finished. Enjoy Lotus Stream Restaurant, a drink in the Piano Bar, or the 12th floor Sky Bar. A good value and comfortable base for exploring Hanoi. A great choice in the Old Quarter. Take a walking tour of the Hanoi backstreets to visit some local markets and specialty food stores to try some dishes and learn more about Hanoi daily life and culinary customs and habits. Visit a small food market in Hanoi, stop for “Che” a local dessert type drink made with sugar cane, green bean, black bean, glutinous rice, and lotus seed. Walk deep into the heart of the old quarter and see the daily life of the vendors making local dishes along the street side. Sample Banh Tom or “shrimp cake”, a local Hanoi specialty, in a small food alley. Sit at a local street side bar for some refreshing local beer “Bia hoi” and before sampling the very delicious “Banh Cuon”, a pan cake made with chicken and pork. Finish the tour with the local way with an iced Vietnamese coffee (Cafe da) or tea (Tra da). This morning you will be met at your hotel by your Insider Journeys guide at 8am to begin this half day city tour with a visit to the Ho Chi Minh quarter to see his Mausoleum and “house on stilts”. Continue onto the Presidential Palace, One Pillar Pagoda and Temple of Literature – Vietnam”s first university now dedicated to Confucian worship. You’ll also visit the “Hanoi Hilton” – the nickname given to the place where U.S pilots were shot down over North Vietnamese airspace and were imprisoned during the Vietnam War – now a museum. Early morning transfer from Hanoi to Halong Bay (approx 3.5 hours). At noon, you will board the Indochina Sails and set sail through the bay while lunch is served. After lunch, visit an interesting floating fishing village with opportunity to interact with the fishermen who have been living in the bay for almost three generations. Later, take a short trek to the summit of one of the islands for a panoramic view of the bay, then enjoy a swim or sunbathing on the sundeck. Finally, enjoy cocktails while watching the sunset and later enjoy a sumptuous dinner. Includes: Cruise accommodation, Lunch and dinner, join-in touring, entrance fees and local English speaking guide on cruise. Greet the day with a morning Tai Chi class and an opportunity to view the sunrise over the bay. Visit a beautiful limestone grotto then head back to the boat for a final glimpse of Halong Bay and a buffet brunch while cruising back to the dock. Brunch included. Transfer back to Hanoi and board the Reunification Express to Danang in a 4-berth shared sleeper cabin. Includes: Brunch, join-in touring, entrance fees, and local English-speaking guide on cruise. One-way train ticket in 4-berth sleeper cabin. Private transfer from Danang train station to Hoi An Resort. 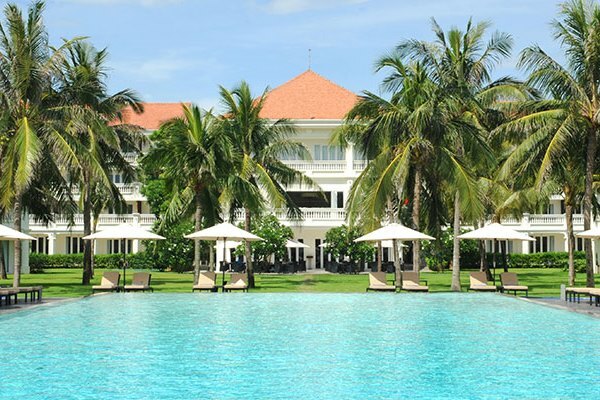 This lovely mid-range resort is set in open grounds facing the South China Sea just a short drive from Hoi An town. Rooms are located in a breezy main building or in smaller two level villas. Each room is well equipped with a blend of modern living and a range of amenities. Relax in the spacious gardens surrounding a central pool or on the resort’s stretch of beach. Dine in the ample restaurant with the choice of international and Vietnamese cuisine, or by the large outdoor swimming pool. Unwind at the spa or steam room, stay fit at the gym, or enjoy a walk along Cua Dai Beach. Includes: Transport in air-conditioned vehicle, private touring, local English-speaking guide. Boutique Hoi An Resort, Hoi An as above. A fantastic addition to Saigon, this property is in an unbeatable location just steps away from Ben Thanh Market. The hotel boasts bright and well-furnished rooms with good facilities. Cool off in the small terrace pool or work out in the gym before exploring the variety of dining and shopping options and Saigon’s major tourist attractions. Saigon is a cultural melting pot with something to offer every traveller – boasting many historic, French-built landmarks, bustling local markets and vibrant street scenes. On this walking tour your knowledgeable local guide will guide you through some of the backstreets of this energetic city. Explore lanes and alleyways few tourists get to see and experience real local street life with all of its colour and activity. Includes: Private touring, English-speaking guide. This morning travel south into the heart of the Mekong Delta. En route, visit a unique Cao Dai Temple and pass farmers tending their fields and drying their produce on the sides of the road. Arriving at Cai Be Port, board your boat for your first look at Delta life as you pass traditional house boats and a small floating market. Visit a local coconut candy workshop then continue along the narrow waterways, stopping to admire the impressive architecture of a century-old house. Enjoy some regional specialties for lunch then visit a nursery before continuing by boat to your overnight guesthouse. You will be welcomed by a local family and learn about the ways of life of the people living in the Delta Region. This evening enjoy a sunset over this amazing river system before enjoying a family cooked meal and a night’s sleep in the guesthouse of the host family. Includes: Lunch, dinner, cruise, transport in air-conditioned vehicles, private touring, entrance fees, local English-speaking guide. This morning continue your exploration of this fascinating area with some cycling to a nearby village. After lunch return to Saigon, arriving by mid-afternoon, back at the Liberty Central Hotel. Private transfer to the airport in the evening to board your return flight home. Arrive home the next day.